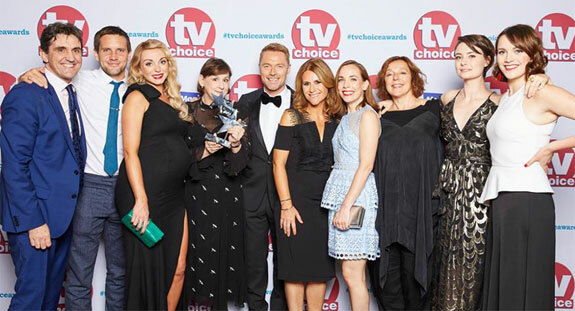 It didn't come as much of a surprise recently when Call the Midwife once again walked off with the award for Best Family Drama in Britain's recent TV Choice awards. 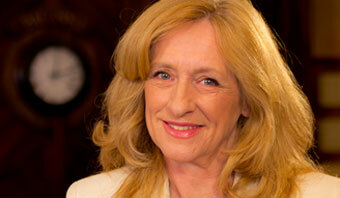 It's their third time running that they have won the award and their sixth TV Choice award in as many seasons. What was a surprise though was the arrival of actress Helen George who has played Trixie in the series since it began in 2012. She looked gorgeous – as usual – in a one-shoulder, black evening gown, split to the thigh, Hollywood-style curled hair, red lipstick and...wait for it...a wonderfully pronounced baby bump! After the award ceremony George proudly revealed that the new father-to-be is none other than her Call the Midwife co-worker, Jack Ashton, who plays Reverend Tom Hereward in the show. Apparently the couple developed a relationship while filming last year's Christmas Special episode which took place in South Africa, fell in love and have been a couple ever since. From left to right: Stephen McGann (Dr. Turner), Jack Ashton (Tom Hereward), Helen George (Trixie), Series Writer Heidi Thomas, award presenters Ronan Keating and Harriet Scott, Laura Main (Shelagh), Annabel Apsion (Violet), Jennifer Kirby (Valerie) and Charlotte Ritchie (Barbara). If you're a Call the Midwife fan, as you know Trixie and the vicar used to be in a relationship, but split up and in the last episode of season 6, Reverend Tom married Barbara, played by Charlotte Ritchie. When interviewed recently, Ashton, who joined the show in season 3, confessed that it was confusing splitting up from Nurse Trixie and then dating the woman who played her! Following the award ceremony, Call the Midwife's writer and Executive Producer, Heidi Thomas, announced that "the entire cast and crew of Call the Midwife, together with everyone at Neal Street Productions, are absolutely delighted by Jack and Helen's lovely news. Along with the parents to be, we are counting the days until we get to meet the newest member of the CTM family." Then it was back to work. After taking a short break over the summer, filming has now resumed on series 7, which should be completed by the end of October. After which the actors can take a break and let the post-production crew take over. It'll be interesting to see how the producers deal with George's baby bump – will it be hidden with an overly large handbag? Or will the pregnancy be written into the show? We'll have to wait until series 7 airs in 2018 to find out. In the meantime, we've got a brand new Christmas Special to look forward to on Christmas Day.